2007 did not start well for Kristen Coyle, Susan Bailey and Karen Dooley. The three sisters faced a bitter-sweet crossroad. Their beloved parents passed away too soon to enjoy retirement and for these three daughters to share those years. Now the nest egg their parents had saved became an unexpected inheritance for the three sisters. It was the decision of the women to use the money in a way that would both benefit all three and, privately, memorialize their parents. They would open a business, a produce business. 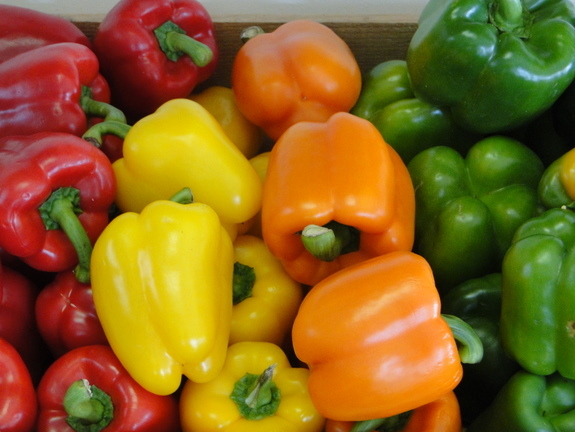 In my opinion after 30 plus years in the food industry, I’d say opening a small produce shop ranks very high on the risky scale in an industry that already is a big risk. It took brains, passion and a sense of humor to turn sorrow into Peas In A Pod. The sisters do not come from a food industry background. Kristen and Susan are both nurses and Karen is a teaching assistant. All were ready to try something different – but anyone can run a food business? Susan and Kristen freely admit that after three years they are still learning – a key ingredient for success. Their Dad, according to Kristen, had an adventurous spirit taking the family on roaming summer drives through the farms of south-eastern Pennsylvania – the famed Pennsylvania Dutch and Quaker farm counties: Lancaster, Chester, Berks, Montgomery and Bucks. The object was to find, and eat, the freshest in-season vegetables and fruits at local farms. “Eating a fresh tomato with salt…,” is a strong memory for Kristen. So is growing up in the Mount Airy section of Philadelphia surrounded by the kitchen aromas of the many Italian households in the neighborhood and sitting down to a freshly made family dinner every night – a tradition these three busy, multi-career women still uphold. I entered the small shop at the intersection of Keswick and Glenside Avenues in Glenside, PA – a leafy, older suburb a mere 10 miles from center city Philadelphia – through a plant framed door that sticks and agitates an old-fashioned bell announcing a customer. Peas In A Pod is in a typical nondescript twin house converted into mixed commercial/apartment space. 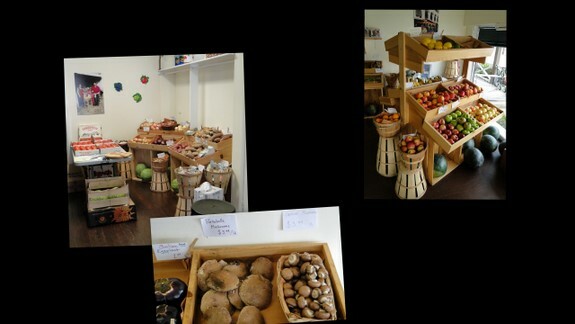 Out in front of the shop is a covered stand with produce available on the honor system. Inside, Kristen was at the counter and Susan, with helper, niece Mary Kate, were in the kitchen. (Karen had the day off). Frequent customers, of which there are many, are greeted by name; perhaps they have a quart of soup reserved. Customers, now friends by association, linger and chat. The interior space of the shop is small, simple and functional. 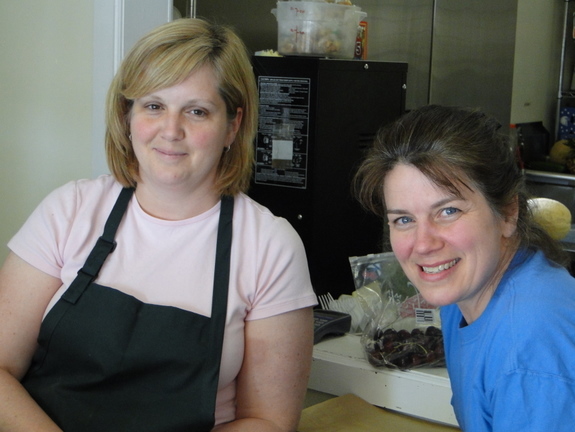 80 South Keswick Avenue was chosen the end of March 2007, and the doors to the shop opened in June – record time for a food business…until the sisters tell me the space was the very small front room – maybe 8 x 10 – of the three rooms. From day one the object was to sell produce from local farms that used green-earth farming techniques from southeastern Pennsylvania counties. For small shops, and any small food business to succeed, it’s necessary to build personal relationships with suppliers. Susan spent days driving through the countryside and was attracted to the corn fields ofTruck Patch Farms in Bucks County and developed the trust necessary to ensure high quality fresh vegetables, fruits and eggs. Truck Patch is their largest supplier. Heirloom tomatoes come from Herrcastle Farms and Jesse Hale of Everhart supplies the raw honey. Patterson Farm’s maple syrup is a personal favorite, and Four Seasons Farm in Lancaster County, as well as orchards in Loyola, PA, supply fruit, especially Pennsylvania’s wide variety of apples. What you will not find at Peas In A Pod are strawberries in January. You also will not find most of their 21 soups during the months of June, July and August, but, fortunately, their incomparable Crab Bisque is available every Friday year round – otherwise there would be serious withdrawal issues. Susan’s responsible for the soup, according to Kristen. (Susan: “What were we going to sell in the winter? Soup!”) Susan wanted to bake breads, make soup and maybe expand into… (the curse of a new business – expand). Expansion is a decision often made too early. Sometimes bureaucracy is beneficial, especially considering the 2008 financial meltdown. Cheltenham Township made it clear that fire codes allowed a maximum of only two hot plates for cooking – no oven without excessive renovations – in the compact kitchen (complete with walk in-refrigerator) that was being constructed in the second room. 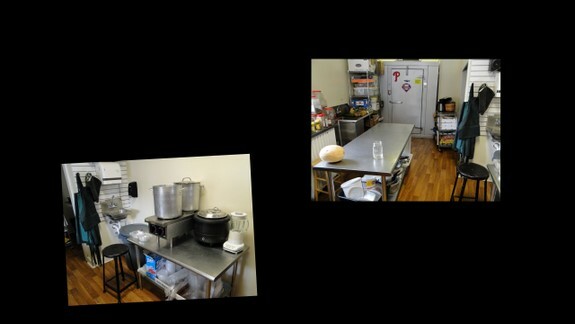 A third small room became more produce and Cento brand packaged pastas and sauces. Susan had a stint, while being a nurse, at Flying Fish restaurant in Chestnut Hill and still has dreams of adding more in-house made products, but reality dictated that soups and salads were a marketable match. With the exception of crab bisque every Friday (300 quarts), the remaining 20 soups rotate with one or two available daily – lemon chicken, bean and potato leek are all favorites. I was allowed only the briefest glance at one of their proprietary recipes, some from their Mother. 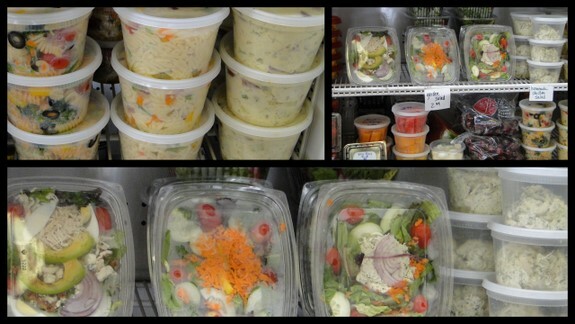 Fresh salads with in-house dressings are in a refrigerated section and range from garden to chicken to orzo. The two professional grade hot plates are doing just fine. 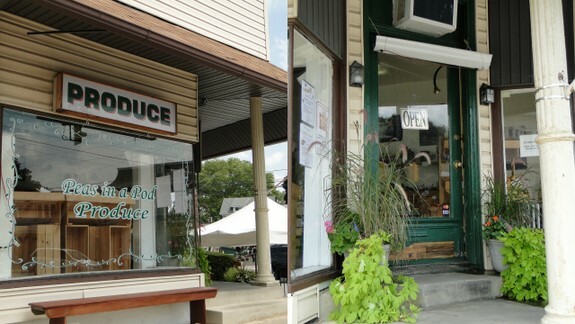 Peas In A Pod celebrated a milestone anniversary this past June 2010: they’re still in business three years after opening – nearly 65% of all food businesses are bankrupt within the first three years. Not that mistakes haven’t been made – the worst was an early over reliance on expensive certified organic produce. Customers preferred the chemical-free products from many local farms that result in “same as organic” at less cost. An obvious suggestion that future marketing of their soups, salads and dressings may be a good idea was met with a look in their eyes that it was already on the table.